Want to be popular on Twitter? Tweet Booster can make you a next big Twitter celebrity. 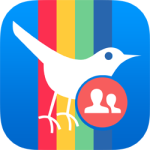 You can get thousands of genuine favorites, retweets and followers with Tweet Booster. You can also track new followers and who unfollow you.